(Nanowerk News) Ceramic textiles, improved jet engine blades, 3-D printed ceramics and better batteries may soon become a reality, thanks to a recently patented polymer from a Kansas State University engineer. Using five ingredients -- silicon, boron, carbon, nitrogen and hydrogen -- Gurpreet Singh, Harold O. and Jane C. Massey Neff associate professor of mechanical and nuclear engineering, has created a liquid polymer that can transform into a ceramic with valuable thermal, optical and electronic properties. The waterlike polymer, which becomes a ceramic when heated, also can be mass-produced. "This polymer is a useful material that really works," Singh said. "Of all the materials that we have researched in the last five years, this material is the most promising. Now we can think of using ceramics where you could never even imagine." Singh is the lead inventor of the patent, "Boron-modified silazanes for synthesis of SiBNC ceramics." Romil Bhandavat, 2013 doctoral graduate in mechanical engineering, is a co-inventer. The engineers developed the clear polymer that looks like water and has the same density and viscosity as water, unlike some other silicon- and boron-containing polymers. "We have created a liquid that remains a liquid at room temperature and has a longer shelf life than other SiBNC polymers," Singh said. "But when you heat our polymer, it undergoes a liquid to solid transition. This transparent liquid polymer can transform into a very black, glasslike ceramic." Ceramics are valuable because they withstand extreme temperatures and are used for a variety of materials, including spark plugs, jet engines, high-temperature furnaces or even space exploration materials. As a preceramic polymer, Singh said the liquid material has several important properties. The polymer is low density and can create lightweight ceramics instead of the usual heavy ceramics. The polymer is scalable and can be mass-produced in grams or kilograms. The ceramic derived from this polymer can survive extreme temperatures as high as approximately 1,700 degrees Celsius. Yet the ceramic has a mass density three to six times lower than that of other ultrahigh-temperature ceramics, such as zirconium boride and hafnium carbide. The polymer can make ceramic fibers. If the polymer is heated to approximately 50 to 100 degrees Celsius, it becomes a gel similar to syrup or honey. During this gel state, the polymer can be pulled into strings or fibers to create ceramic textiles or ceramic mesh. The liquid polymer has processing flexibility. It can be poured into molds and heated to accurately make complex ceramic shapes. Because the polymer is a liquid, it is sprayable or can be used as a paint to make ceramic coatings. The ceramic can protect materials underneath or can create more efficient machinery that works in high-temperature environments, such as steam turbines or jet engine blades. The polymer also may be used for 3-D printing of ceramic parts using a benchtop SLA printer. When combined with carbon nanotubes, the polymer has even more applications. It can create a black material that can absorb all light -- even ultraviolet and infrared light -- without being damaged. The combined nanomaterial can withstand extreme heat of 15,000 watts per square centimeter, which is about 10 times more heat than a rocket nozzle. The polymer could be used to produce ceramic with tunable electrical conductivity ranging from insulator or semiconductor. 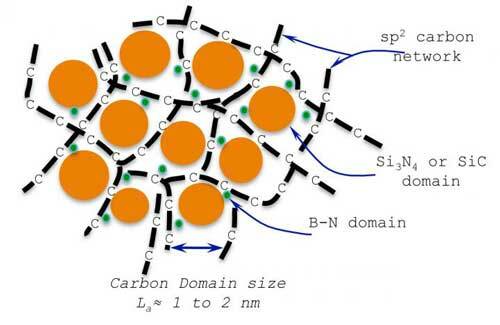 The presence of silicon and graphenelike carbon in the ceramic can improve electrodes for lithium-ion batteries. The ceramic derived from this polymer has a random structure that is generally not observed in traditional ceramics. The silicon in the ceramic bonds to nitrogen and carbon but not boron; boron bonds to nitrogen but not carbon; and carbon bonds to another carbon to form graphenelike strings. This unique structure provides stability at high temperature by delaying reaction with oxygen. "Often, researchers have only looked at high-temperature properties," Singh said. "We are among the few that looked at other properties -- such as electronic, electro-chemical, thermal and optical properties -- and exposed these properties in this material." Singh's research has been supported by the National Institute of Standards and Technology radiometry team and the National Science Foundation. He is continuing to research the polymer's possibilities for making ceramic fibers and even battery electrodes.